The International Consumer Electronics Show (CES) 2018 was the perfect tech event for Panasonic to celebrate their 100-year company anniversary together with consumers and vendors of electronics. This was my first CES so naturally I was excited to be in attendance on behalf of Panasonic USA and THE Sports Techie community blog. My experience was made even more memorable because of the two-hour power blackout at Central Hall. I attended the world’s best electronics trade show as a social media influencer and industry expert. 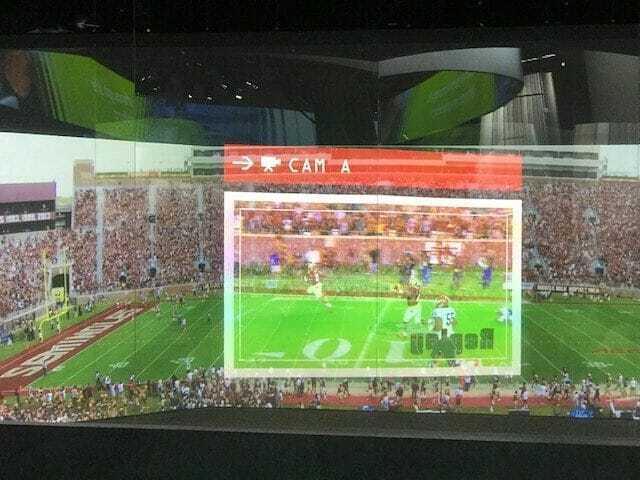 In particular, I represented Panasonic’s sports tech, immersive entertainment technologies and Smart Venue Solutions that use window AR projection and mixed reality technology to recreate live action in remote locations while simultaneously assisting with improving the digital fan experience inside stadiums from tickets, to personalized content though smartphones, to live gameday or matchday updates. Over one hundred thousand people invade the Vegas strip to take part in this technology extravaganza; it sure was fun to be a part of this iconic tech event. The sport business issue at hand for Panasonic is to help teams, owners and management fill stadiums and arenas with happy fans when it can be easier and less expensive for a fan to watch live events on a killer home entertainment center. I witnessed firsthand how Panasonic technologies at the Golden 1 Center, home court of the Sacramento Kings, and at SunTrust Park and the Battery mixed use community in Atlanta, home ballpark of the Braves, both enhanced fan experiences while providing sponsorship revenue and ROI. To address this fandom reality, Panasonic unveiled the “Smart Venue Solutions” mixed reality tech booth to showcase how augmented reality and 3d projection mapping integrate together to provide a crystal clear display interface that’s personalized in say a suite with cool features home viewers cannot engage with such as remote camera angle control, updated fantasy football data and social media engagement opportunities, plus merchandise and concession sales. 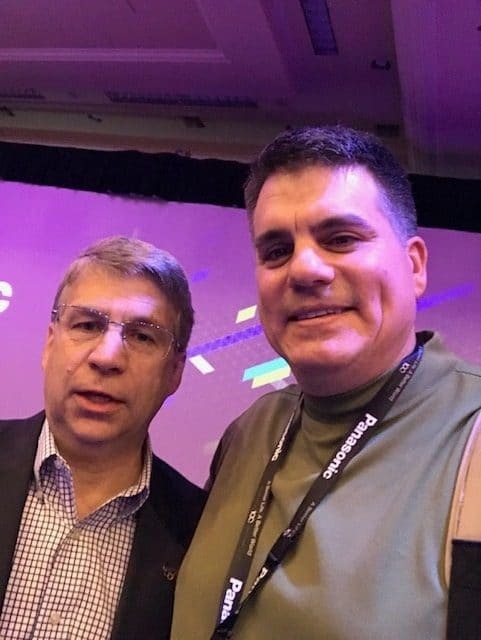 THE Sports Techie selfie with Tom Gebhardt, Chairman and CEO, of Panasonic USA. Tom is spot on with his statements. Panasonic does have more in mind than simply providing clients the world’s best-in-class video boards. The company does indeed think more on the lines of using technology to enhance the entirety of live performances. Because I like to guerrilla market, I asked Tom if he would do a selfie with me after introductions. He graciously accepted my social media-driven request. Panasonic also announced their partnership with the USOC and resulting immersive entertainment upgrades at the US Olympic Museum visitor center in Colorado Springs. I showed up to the Panasonic booth early in the evening on Monday to get acquainted with the technologies, booth layout and content. Founder, Kōnosuke Matsushita, began Panasonic 100-years ago when he upgraded a bike lamp candle with an electrical battery. Image that! To start the tour, visitors first watch video on a LED 4K ribbon board about the 100-year history of Panasonic. Next, guests walk into a large film room and through the assistance of a large 4K LED video board and a real human actress, Panasonic provided an insightful look into the near future. The film covers how smart homes will power neighborhoods and provide improved quality of life, how unmanned cars allow for time to take care of personal tasks, and how kids are taken care of with data-driven decision making. I ended up sitting right behind the President and CEO of Panasonic Corporation, Kazuhiro Tsuga, during the private interactive movie viewing. I next checked out the Live Performance section of the Panasonic booth. Viewers are provided with a futuristic look into the life of a young child and his personal assistant as they age together. The robot learns more and more about what being human is all about while adapting its appearance and observations to be more human like. A human actor dressed as the last version of the humanoid robot took us around the corner to see the 3D projection mapping technology displaying two remote robotic dancers at the fictional city of Femm. 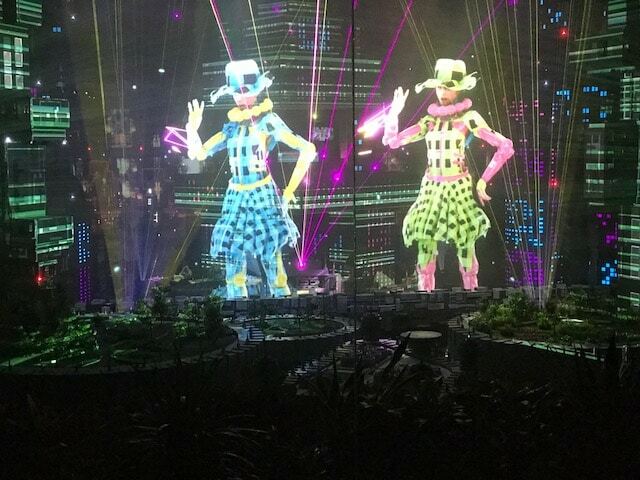 Panasonic 3D projection mapping displaying two remote robotic dancers at the fictional city of Femm. We finished up the first day with filming b-roll and discussing my perspective on camera about Panasonic immersive entertainment, AR projection and mixed reality technology. 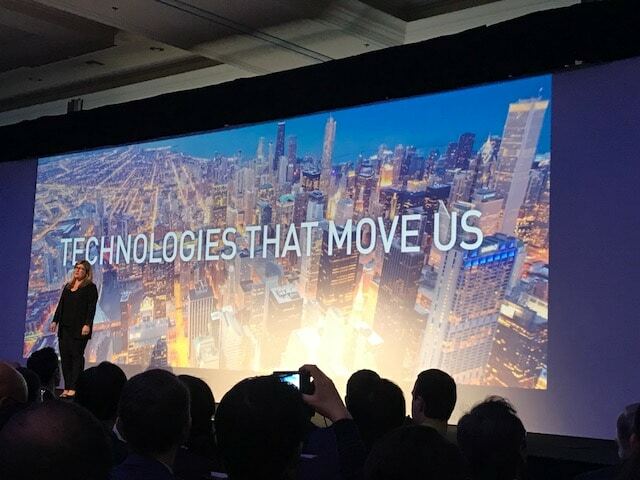 From Panasonic, “Our industry experts give you an exclusive sneak peek at Panasonic’s top 5 emerging technologies at CES 2018, including automotive, avionics, immersive entertainment, integrated supply chain and sustainability. Everything from a living space autonomous cabin, 2170 Lithium Ion Battery, to AR Projection & Mixed Reality Technology, Retina Scanning & Biometric Sensors, and RFID Checkout Solutions are a preview of next-gen technologies being shown at CES 2018! Tuesday was a crazy rain day. Being in the desert, I learned this is a rarity. The “Hey Google” booth outside the Las Vegas Convention Center was shut down because it was mostly designed for outdoors. CES officially opened to the public at 10 am which is when I was scheduled to shoot the rest of my video clips you can watch on the Panasonic USA YouTube channel. I interviewed Ted Leamy, Director of Immersive Solutions Group, at the booth entrance about what Panasonic was doing at in the sport and live entertainment industries as well as at CES while gathering additional expert insight about their Smart Venue Solutions. Once I finished with filming, I walked around Central and South Hall to check out the other booths. I saw a concentration of technology focused on automobiles, robots, aviation, drones, gaming, health, wellness, fitness, 8K, virtual reality and augmented reality, 5G, data transfer, and lots of new cameras, video recorders and large smart televisions mixed in with a nifty little wristband screen. Wednesday was my last full day. I was fortunately able to take part in the Oakland Raiders tour. We gave the Raiders IT Director a tour of the Panasonic CES booth that included the Smart Venue Solutions area. Our next tour with more Raiders officials was going through introductions when the blackout occurred. Everyone did their best to wait it out but in the end, the Raiders tour was postponed for a later time and day. Construction on the new Las Vegas Stadium in Vegas should be finished in time for the 2020 season. I sat right behind the President and CEO of Panasonic Corporation, Kazuhiro Tsuga, during viewing of the interactive and futuristic movie made for CES 2018. Sports Techie, what a blast I had at CES 2018. Meeting the Panasonic social media team from Japan and here in the United States was awesome for finally putting faces to names. In addition, the energy each CES attendee generates is certainly contagious to be around. In addition, the overall focus on sports tech at the event was front and center. ‘Mixed reality technology’ is indeed, a new term or buzz words to learn. 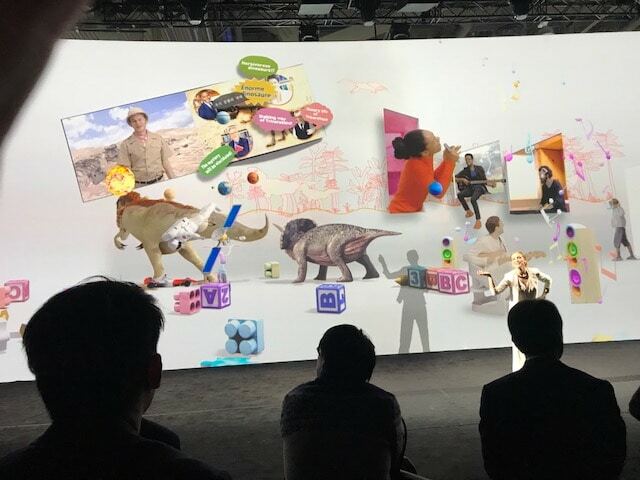 Panasonic blends a mix of augmented reality and 3D projection mapping to provide partners with cutting-edge solutions that integrate with their other industry-leading solutions such as LinkRay, data-storage devices, in-flight entertainment systems and smart design cockpits. I like being able to bring up my own stats, replays and camera angles, all features Panasonic technology enables. Panasonic facial-recognition, admission management and stadium navigation technologies take users and patrons alike to new levels of interactivity such as ticketing, taking a picture with a favorite player through AR or drone deliveries to your seat. After CES, I am more excited than ever for the upcoming Winter Olympics next month in Korea because Panasonic has a major PyeongChang 2018 presence as they will during the Tokyo 2020 Summer Olympic Games in Japan. Much appreciation to all those involved with partnering me up with Panasonic through CES 2018, my gratitude is immense. A final shout out to my cousin and his wife for hosting me in their Vegas home. Interacting with all the technologies in person at CES delivered home why Panasonic Moves Us as a global leader with over 240,000 employees, and sales of more than $70 billion dollars a year. The future of technology, the fan experience and Smart Venue Solutions are in good hands with Panasonic.